We will be hosting a special lecture tonight for our 2018 Lecture Series with the Comstock Foundation for History and Culture! Dinner starts at 6:00 p.m. and lecture starts at 7:00 p.m. The Most Intrepid Western Author’s Posse is comprised of four published, award-winning western authors who love to tell exciting tales of the Old West – some true, some with a twist. 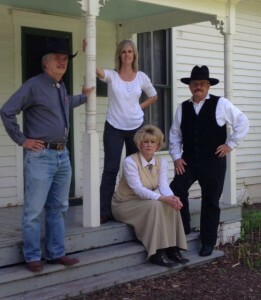 Take a literary ride with the Author’s Posse as they travel from across the west into Gold Hill on July 26 where they will speak at the Gold Hill Hotel. Stories told by the posse promise to transport readers back to the days of the wild frontier when times were rowdy and justice was swift. The Posse will be discussing their books and the taming of the Wild West. Their books will be for sale at each stop and the authors will be available to sign them. Chris Enss, author of The Pinks: The First Female Operatives, Detectives, and Spies with the Pinkerton National Detective Agency, The Principles of Posse Management: Lessons from the Old West for Today’s Leaders, Frontier Teachers: Stories of Heroic Women of the Old West, Hearts West: Mail Order Brides of the Old West, and Object Matrimony: The Risky Business of Mail-Order Matchmaking on the Western Frontier. Have dinner with us before the lecture! We have reservation times at 6 p.m. this evening. Please see the sign up form below to make reservations for this exciting lecture! This lecture might very well sell out! If you are coming to the dinner and lecture, what time would you like to dine with us? 6:00 p.m.
Comstock Classic Car Show – Prix Fixe Dinner!